Although I have visited Athens countless times, and have often climbed the rock of Acropolis, I only recently visited the new, award-winning Acropolis Museum, which opened in 2009. I was spending a weekend in Monasitraki in August in an apartment with 180-degree views of the Acropolis by day and by night. We were close to the Plaka and the main tourist, archaeological and historical sites in the centre of Athens. Most of my visits to Athens in the past were working visits as a journalist. 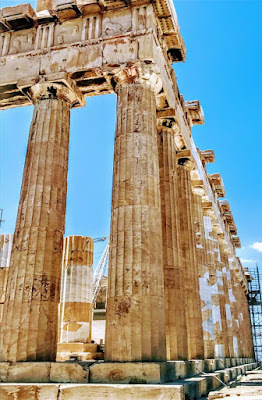 But now, with classical Athens on our doorstep, two of us decided to visit the Acropolis one morning and to take a guided tour of the New Acropolis Museum in the afternoon. The temples on the ‘sacred rock’ of Athens are breath-taking in scale. These are the most important monuments in the western world and they have exerted more influence on our architecture than anything built since. The great marble masterpieces were built during the ‘Golden Age of Athens,’ during the rule of Pericles in late fifth century BC. The three principal sites on the Acropolis are the Propylaia, the Parthenon or the Temple of Athena Nike, and the Erechtheion. The Propylaia is the monumental or grand entrance through which all visitors entered the Acropolis. It was built in 437-432 BC and was designed by the Athenian architect Mnesikles. The Parthenon or Temple of Athena Nike was built in 427-423 BC by the architect Kallikrate and under the supervision of Phidias. It replaced an earlier small temple, and is the epitome of ancient Greek classical art and architecture. The Erechtheion is the last of the buildings dating from the time of Pericles. It was a temple to Poseidon and Athena, with a porch supported by pillars in the shape of statues known as the Caryatids. Building work finished around 410 BC. The Parthenon was a temple dedicated to the goddess Athena, the patron of the city, and also served as the city treasury. It was built to celebrate the defeat of the Persians by Athens. The pediments and metopes or carved pictorial panels above the frieze of the Parthenon were decorated with mythological subjects. In contrast, the sculptor Phidias decided to decorate the frieze with an elaborate and eloquent depiction of the Panathenaic festival in honour of Athena. This festival took place every four years, lasted 12 days and included rituals and sacrifices, as well as athletic and musical contests. On the last day of the festival, the Panathenaic procession took place from Keramaikos through the city and up the cliffside of the citadel to the Temple of Athena at the Parthenon. The story of this procession unfolds in more than 160 metres of continuous sculptural decoration on the Parthenon frieze. The frieze consisted of 115 blocks, was 160 metres long and was 1.02 meters high. Some 378 human figures and deities and more than 200 animals, mainly horses, were depicted on the frieze. Groups of horses and chariots occupy most of the space. They are followed by the sacrificial procession, with animals and groups of men and women carrying ceremonial vessels and offerings. The procession concludes with the giving of the peplos, the gift of the Athenian people to the decorated statue of Athena. To the left and right of the scene sit the twelve gods of Mount Olympus. From that entire frieze, 50 metres are in the Acropolis Museum in Athens today, 80 metres are in the British Museum, London, one block is in the Louvre in Paris, and other fragments are scattered in museums in Palermo, the Vatican, Würzburg, Vienna, Munich and Copenhagen. The Acropolis Museum is only 280 metres from the Parthenon, or a short 400-metre walk. It stands by the south-east slopes of the Acropolis hill, on the ancient road that led up to the ‘sacred rock’ in classical times. It has a floor area of 14,000 square metres and includes 4,000 artefacts from the Acropolis hill. The first museum on the Acropolis was built in 1874. It was expanded in the 1950s, but with successive excavations it was unable to house new finds. When I first visited it almost 30 years ago, it had already outgrown its capacity. The new museum was first planned in the 1990s, but work was delayed for years and eventually abandoned because of sensitive archaeological finds on the site. A new museum site was identified at Camp Makrygianni, an unused police barracks opposite the Theatre of Dionysus. It was agreed to build the new museum on pillars, elevated above any archaeological finds, and the new competition was won by the Swiss-born New York architect Bernard Tschumi, who worked closely with the Greek architect Michael Photiadis. The museum stands on the ruins of part of Roman and early Byzantine Athens. During excavation work, archaeologists found two layers of houses and workshops, one from the early Byzantine era and another from the classical era. As building work came near its completion in mid-2007, a delicate operation began to move the artefacts from the old museum on the Acropolis. Three tower cranes moved the collection without a mishap, and after six years of planning and building, the new museum opened in 2009. The principal exhibits include statues and friezes from the Parthenon and the Caryatids from the Erechtheion. But there are treasures from other temples too, everyday items from archaic, classical and Byzantine Athens, and finds from early Christian homes in Athens, including mosaics, busts and amphorae. The collections are exhibited on three levels, while another, middle level houses the museum shop, café and offices. As the museum is built over an extensive archaeological site, the floor, outside and inside, is often transparent so visitors can see each floor above and below and down the excavations below. At each level throughout the building, I could gaze down through the glass floor panels to see the excavations that revealed some of the exhibits. 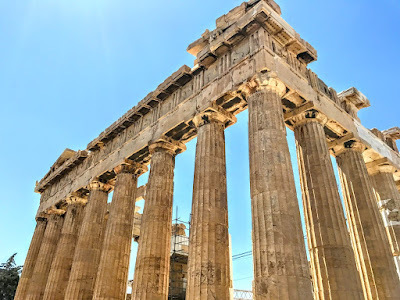 After crossing the ground floor lobby towards the turnstiles, I was in an ascending, wide glass-floored gallery that houses finds from the slopes of the Acropolis. The occasionally transparent floor provides a view of the archaeological excavation, while the upward sloping floor alludes to the ascent to the Acropolis. In antiquity, the slopes marked the transition area between the city and the sanctuary. This was the area where official and popular cults, as well as large and small sanctuaries, existed alongside private houses. This gallery houses finds from the sanctuaries on the slopes of the Acropolis, as well as everyday objects that Athenians used throughout time. Finds from some of the key sanctuaries on the slopes are exhibited on the left. Finds from the smaller sanctuaries and settlements that developed on the slopes of the hill are displayed on the right. Visitors then arrive in the Archaic Acropolis Gallery, a large hall that accommodates archaic findings. The archaic period lasted throughout the seventh century BC until the end of the Persian Wars in 480-479 BC. During this period, city-state developed, making the transition from aristocracy to tyranny and, eventually, to democracy. It was a period marked by great achievements in the economy, art and intellectual life. The exhibits in this gallery can be viewed as three-dimensional exhibits in the changing natural light, and visitors can see the delicate surface details of the sculptures. On the south side of the gallery, depictions of young women (korai), the horse riders (hippeis) and others provide a striking picture of the Acropolis in the Archaic Period. Other artefacts and sculptures from the other Acropolis buildings on this floor including the Caryatids and other items from the Erechtheion, the Temple of Athena Nike and the Propylaea, and findings from Roman and early Christian Athens. At the top floor of the museum, the Parthenon Gallery sits askew above the lower levels, giving it the same orientation as the ancient temple on the Acropolis. 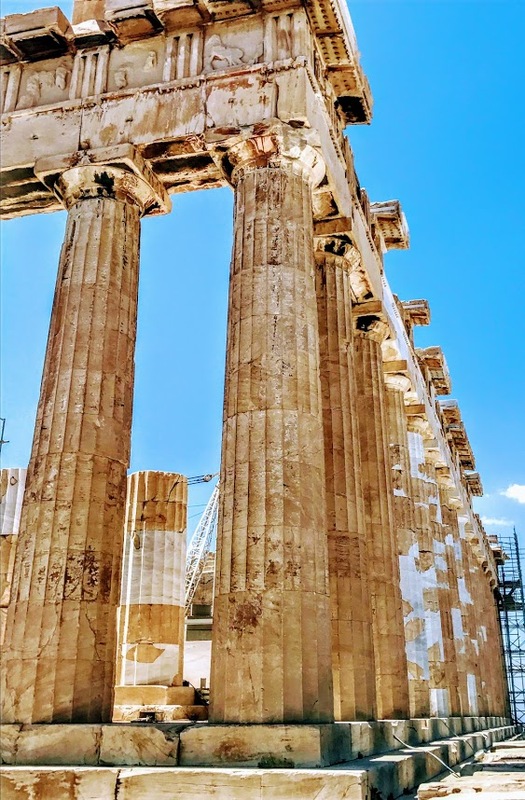 The spacing of the columns in the Parthenon hall is the same as that of the ancient temple, and glass walls on all four outside walls allow the natural light to illumine the Parthenon marbles as it would have on the ancient temple. The 48 columns in the Parthenon hall mark the outline of the ancient temple and form a colonnade that displays the Parthenon marbles. To make viewing easier, the pediment marbles are displayed at eye level in front of the end columns. The metopes are displayed on the columns, two per column, but not as high as they were in the ancient temple. The frieze is displayed behind the metopes, forming a continuous band around the walls of a rectangular space set inside the columns, as in the ancient temple but not as high, again for ease of viewing. The frieze is installed on a rectangular cement core that has exactly the same dimensions as the cella of the Parthenon. This allows a comprehensive viewing of the details of the frieze as the visitor walks around the perimeter of the gallery. The story of the Panathenaic Procession is pieced together with a combination of the original blocks of the frieze and cast copies of the pieces in museums abroad, including the British Museum and the Louvre. In the same area, ancient marble inscriptions record in detail the costs of building the Parthenon and the statue of Athena Parthenos. From the north side of the Parthenon hall, we could see the ancient temple on top of the Acropolis. Bernard Tschumi’s museum has won international awards each year since it opened, including awards from the British Guild of Travel Writers, the American Institute of Architects, the Keck Award of the International Institute for Conservation and the International Association of Lighting Designers. Last year, the museum ranked ninth in TripAdvisor’s list of the 25 Best Museums in the world. An additional motivation for building the new museum came from the responses that came every time Greece asked for the return of the Parthenon Marbles from the British Museum in London. British officials claimed Greece had no suitable location to house the portions of the Parthenon frieze and other parts of the Acropolis that had been hacked away and pilfered by Thomas Bruce, Earl of Elgin, in 1801-1812. The creation of this gallery to display of the Parthenon Marbles has been the key to all recent proposals for a new museum, and Greeks now hope the museum will boost the campaign for the return of the Parthenon Marbles to Athens. This feature was first published in November 2017 in the ‘Church Review’ (Dublin and Glendalough) and the ‘Diocesan Magazine’ (Cashel, Ferns and Ossory).